Sri Kengal Hanumanthaiya Law College previously named as KGF Law College established in the year 1979. The College is governed by the Golden Valley Educational Trust, KGF under the guidance of its President emirates Late Dr. T. Thimmaiah, B.Sc,(Hons) PhD. (London),IAS, (Retd),President now under the able guidance of Dr. T. Venkat Vardhan, President GVET. The College was established with the primary objective of imparting Legal Education to the society especially for backward, poor and downtrodden students at KGF, Kolar District & the surrounding states of Karnataka. The college campus is having a green, beautiful, and an ideal Shanthi Nikethan atmosphere. The college has been recognized by The Bar Council of India, Affiliated to Karnataka State Law University and Approved by the Govt.of Karnataka. The College is Offering two courses, 3 years LL.B & 5 years LL.B integrated degree. Late Sri Kengal Hanumanthaiya the Ex. Law Minister, Govt.of India and Former Chief Minister of Karnataka was an architect of Vidhana Soudha of Bangalore, was responsible for Nationalizing KGF Gold Mines in 1956 when he was the Chief Minister of erstwhile Mysore State to manage the affairs of the Gold Mines indigenously. He got a resolution passed in the State Assembly to Nationalize the Gold Mines. Thereafter he approached the then Prime Minister of India Sri Pandit Jawaharlal Nehru to apprise the decision of the State to Nationalise the KGF Gold Mines accordingly the Gold Mines of KGF was Nationalised. Sri Kengal Hanumanthaiya had taken initiation for the unification of the State of Karnataka on the linguistic basis, With his intellectual ideas, prominence, honest, and dedication to the State, the State of Mysore had been unified during 1956.He was the Architect of Vidhana Soudha , under his able guidance Vidhana Soudha was constructed . To remember him and to honour his principles, Values and inspiration the Management of Golden Valley Educational Trust in his memory has changed the name of KGF Law College as Sri Kengal Hanumanthaiya Law College, Accordingly the Govt. of Karnataka accorded permission and the University had notified to change the name of the KGF Law College as Sri Kengal Hanumanthaiya Law College at KGF, with effect from the academic year 2007-08. The institution will take all measures to fulfil the vision by providing the students with adequate knowledge in legal system and growing corporate trends. Ensure scholarly and vibrant learning and research environment that enables students to excel in advocacy and all round personal development. 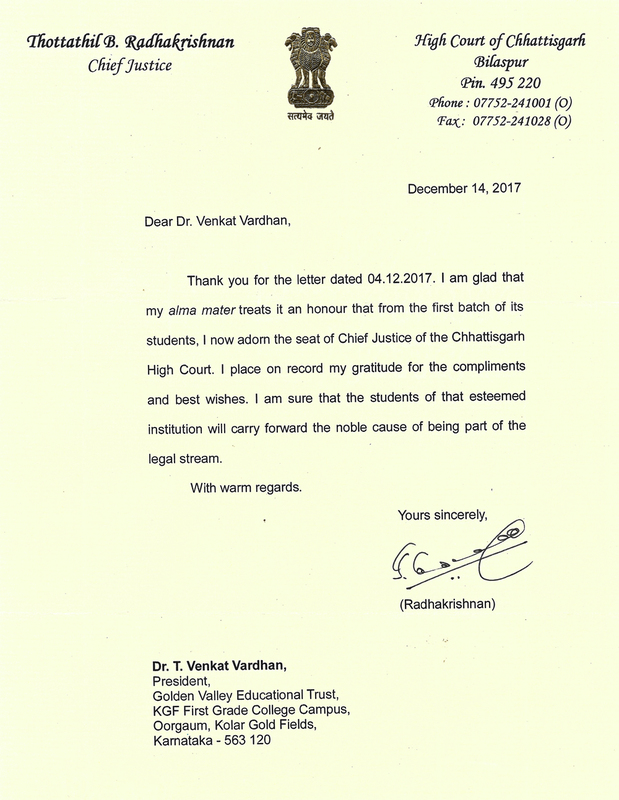 The institution committed to achieve in creating a Law literate society by imparting quality education in law to meet the needs of aspirant lawyers striving to protect human dignity, social welfare and justice through knowledge of law. Well Qualified, Experienced and Dedicated teaching faculty. Well-furnished library with law journals. Moot court with similar court atmosphere to equip the knowledge for the students. Mock trials and arguments on various moot courts. Modern canteen & Transport Facilities. PRINCIPAL : Dr. G. Mathews. Qualification : M.A, LL.M, M.Ed., M.Phil., Ph.D.
Dr. G. Mathews was born and brought up in Kolar Gold Fields. By his hard-work, continues effort in education and Leadership Quality he became the Principal of Sri.Kengal Hanumanthaiya Law College. He is an educationist and man of high integratity and discipline. He excelled in completing Bachelor Degree and Master Degree in Law, Education, Arts and Theology. Before taking over as Principal of Sri.Kengal Hanumanthaiya Law College, he served as Principal of college and academic institutions and acquired experience in academic and enriched in administrative experience over 15 years. He did Post Graduation in personnel management and industrial relations, M.Phil. in law, awarded Doctorate in Law and religious science. He is a reputed practice in advocate earlier. Under his leadership, the college at new campus has gained impressive improvements in admission and office administration. His ambition is to transform Sri.Kengal Hanumanthaiya Law Collages as one of the best institution in legal Education. Mr. P. Prasanna Kumar, LL.M., M.Phil - Lecturer. Ms. K.Shivapriya, LL.M - Lecturer. Mrs. S Meenakshi, LL.M. - Lecturer. Mr. Thanga Primala, LL.M. - Lecturer. Mr. N Manjunath Swamy, M.A., ( Pol.Sc ) - Lecturer. M Anusiya, M.A., M.Ed (English) - Lecturer. Mr. Ganesh, M.A., Ph.D., (Sociology) - Lecturer. Ms. Sumithra, M.A (Eco)., B.Ed., M.Phil - Lecturer. Mrs. Mariya Samsan Fradey, LL.M. - Lecturer. Mr. Venkataravanappa, M.P.Ed - Physical Director. Mr. E P B Chinmayanandan, LL.M - Lecturer.